Before a large training session or before a race, it's good to treat yourself to a nice plate of spaghetti. 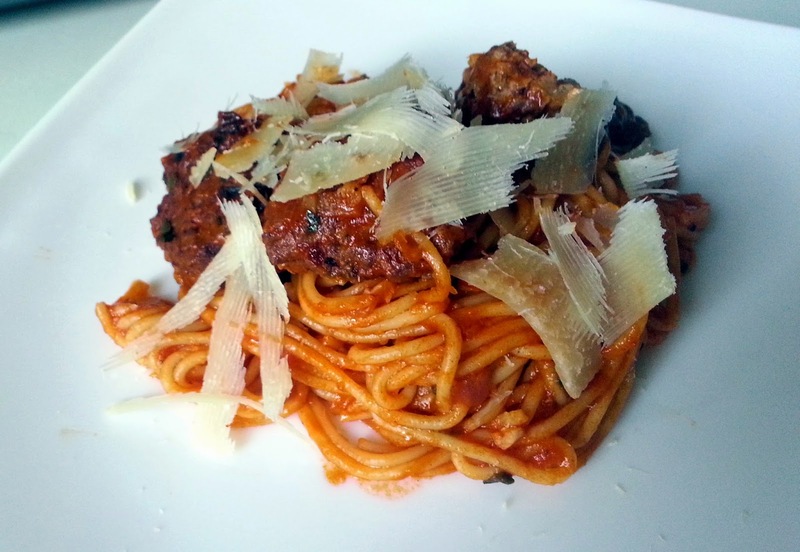 But plain ordinary spaghetti is never a good idea, so here is a nice twist on the well known spaghetti with meatballs. It's hot, tasty and you'll want another helping :). Finely chop the onions, and combine them in a large bowl with the beef, eggs and add generous amount of pepper, allspice and salt. Add the flour and mix everything. If the mixture becomes too dry, add a little water to relax the mix. After a good mixing, let the mixture rest for 1-2 hours. After the mixture has rested, create small meatballs (2 centimetres diameter, and flatten them slightly). Fry the meatballs on both sides in a large pan until well fried on the outside put them aside but do not cover them so they don't continue cooking from the heat. Drain most of the oil from the pan. While you fry the meatballs, bring a large pan with water to the boil. Add a tablespoon of salt and several drops of olive oil. Add the spaghetti to the pan, reduce the heat and let the spaghetti cook. When the spaghetti are nearly cooked - still al dente, turn the heat off and leave them in the water. Finely chop the onions and put them in the pan where the meatballs were frying. Cook the onions until they start turning golden, then add the chopped garlic. Cook for a minute, then add the tomato paste, and a tablespoon of chilly sauce and worcestershire sauce. Season with salt and allspice, stir and bring the sauce to the boil. Taste, and possibly add another tablespoon of chilly sauce. You want the sauce to be hot but not too hot. Put the spaghetti in the pan with the sauce, and stir it in while the sauce is boiling. If the sauce is too thick, add a ladle of the water the spaghetti were cooked in to the sauce and stir. When you are happy with the consistency, add the meatballs (4 per person) to the pan with spaghetti and sauce, stir in and take the spaghetti off the heat. Serve immediately, putting the spaghetti on the bottom of the plate, and top with meatballs. Put thin shavings of Grana Padano cheese on top of the spaghetti and meatballs. The spaghetti will be hot and will carry the taste of the sauce, while the meatballs are still crispy and tasty. Want to know about Veterans Day,which is a day to celebrate the great officers of the US army,just checkout my blog Veterans Day 2016 Poems and stay updated.